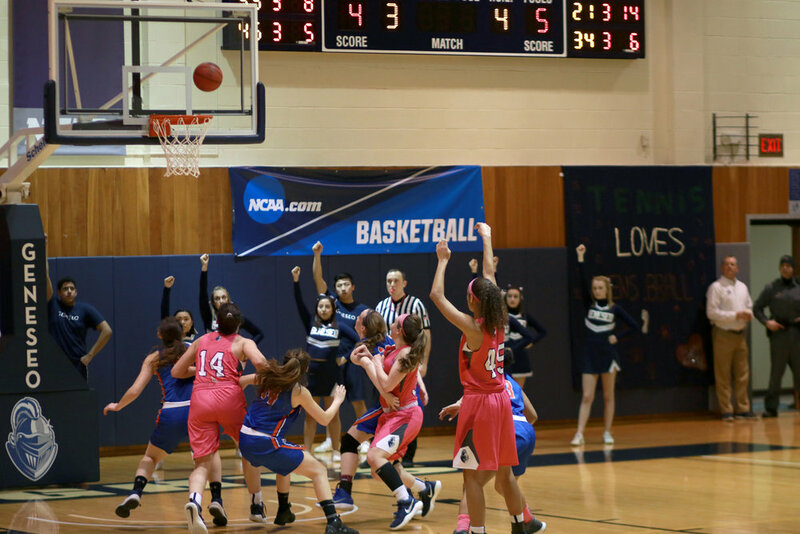 With the regular season completed as of Saturday Feb. 17, the Geneseo women’s basketball team will make its first playoff appearance of 2018 on Friday Feb. 23 at home. Thanks to an impressive regular season record—which allowed the Knights to take the No. 1 seed in the SUNYAC standings—Geneseo will have home court advantage for the duration of this year’s playoffs. While playing for the home crowd doesn’t guarantee a victory, it certainly helps the women’s momentum. The Knights will take on the No. 4 seed SUNY New Paltz Hawks this Friday. Although Geneseo produced a 2-0 record against the Hawks this season, the team will not be taking this game lightly. The young Geneseo roster is still all too familiar with New Paltz after their crushing loss in the SUNYAC Championship game last year, which ended the Knights perfect season. Since that game, New Paltz has also undergone some significant roster changes, including the addition of a large freshman class. The team, however, has not experienced the same amount of success as Geneseo has, despite being in a similar situation. Prior to their last games, the Knights were on a tear, consistently demolishing their opponents with final scores in the double digits. The game at SUNY Cortland on Friday Feb. 16, however, showed a different story. After being outscored in two of the previous three quarters, the Knights found themselves behind moving into the final quarter of gameplay. Geneseo was able to avert the potential crushing loss by fending off the Red Dragons 68-67. Ciotti explained what the team plans to improve upon following Friday’s close game. “We really have to brush up on rebounding and communication on the court,” Ciotti stated. Geneseo had yet another impressive regular season, recording 23 wins with only two losses, both of which came in non-conference games. The Knights showed steady improvement throughout the entire year. “We started to put more effort and energy into our defense and boxing out, which really has helped us win some big games,” freshman guard Lindsay Halpin said. The Knights have solved any issues surrounding chemistry, as a good number of the players are freshmen this year. “I also think that our chemistry is constantly improving, and we are starting to understand what each players’ strengths are,” Halpin said. Junior forward McKenna Brooks and freshman guard Natalie Alfieri topped the Knights roster with 24 of 25 games started. Brooks led the team with 299 points on the season, while Halpin played the most minutes with 673, which converts to 11 hours and 13 minutes. The women aim to continue adding on to these positive statistics during the SUNYAC Tournament, where they hope to be as successful as they have been throughout this entire season.